I made some triton murrini that I’ve been having fun with. They’re very simple: core, triton, contrasting stripes, but they’re effective and you can get a whole load of different effects depending on how you treat them. Here are a few examples! You can leave them raised and poke them, melt them flush and encase them, poke them and encase them, reduce them more or less… The top left one is briefly reduced and left raised – it’s a shiny but dark blue. The one next to it was encased. 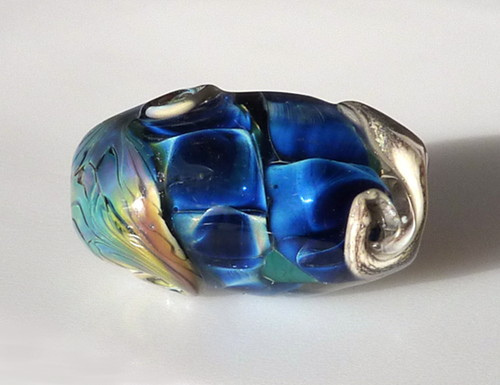 The pale blue-silver ones are reduced for longer and then encased. 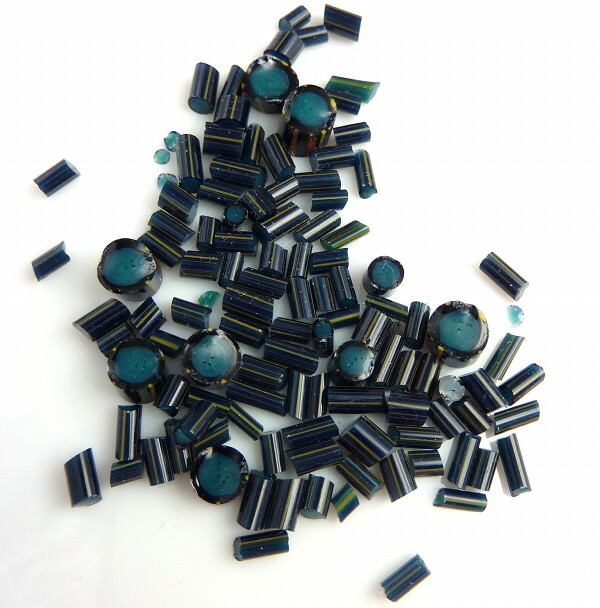 The bottom right pair with the dark blue and green are reduced a couple of times and encased in Lauscha soft clear. The shiny gold-pink one middle right is left raised and was reduced multiple times on a hothead – I was very surprised by the effect! The dark blue and green effect is probably my favourite. Here’s the bead I got it on. It was made for January’s theme of the month, “Blue Winter”. 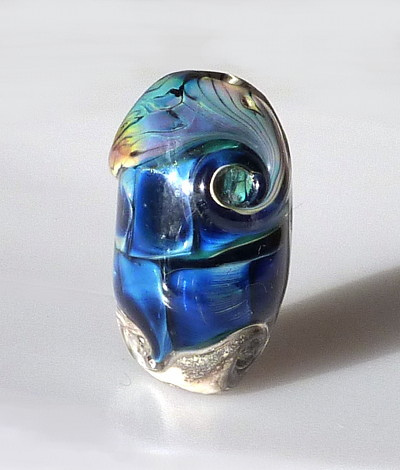 The base is Lauscha dark teal (aka steel blue), tornado encased in soft clear and with SIS shard fragments and the triton murrini. I like how it came out a lot. 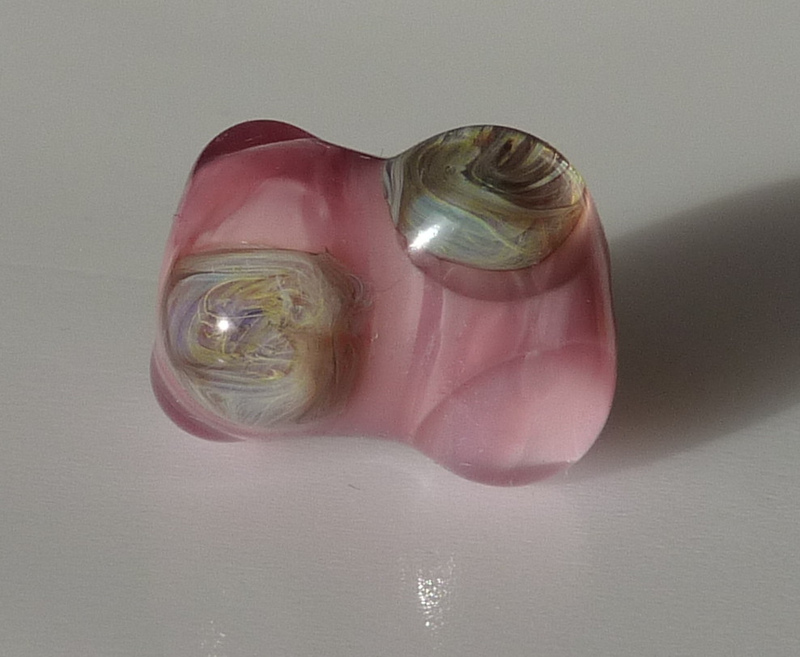 I don’t actually know if the soft clear affected the colour I got in the murrini – all the other encased ones are under 006, but I also treated this one differently, so who knows? I have a striking murrini that needs a bit more experimentation, and I just made a batch of murrini with psyche in – we’ll see how they come out. When these came out of the kiln, you could say that I was pleased! Triton caterpillar over CiM mermaid (you can see a little bit of mermaid in the second pic, but not much is visible) with SiS on one end and a magic+hades twistie on the other. Look at the colours in the magic! Using Anouk’s secret recipe for hot pinks! 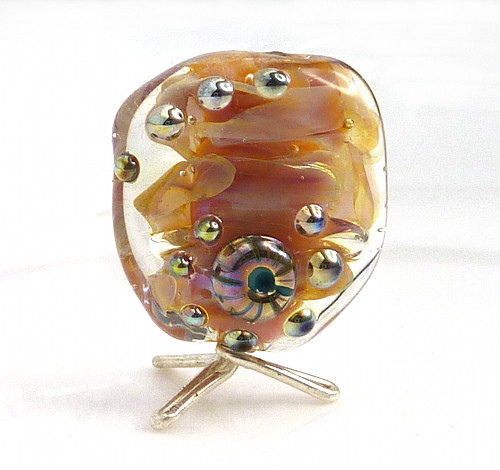 Actually, I have no idea if that is a secret or not, but she is doing a third silver glass tutorial that will cover it. I think the wraps on the ends were multicolour dark. This is aurae spiralled over Reichenbach mystic pink. The wisps have more iridescence in person. The surface is triton dots and one of my triton murrini, believe it or not! I think I reduced multiple times for it to end up like this. I haven’t quite got as good results since, from the ekho at least. But I’ve been zipping about trying out different glass, so it probably just needs a bit of attention. I like triton, it’s well-behaved! 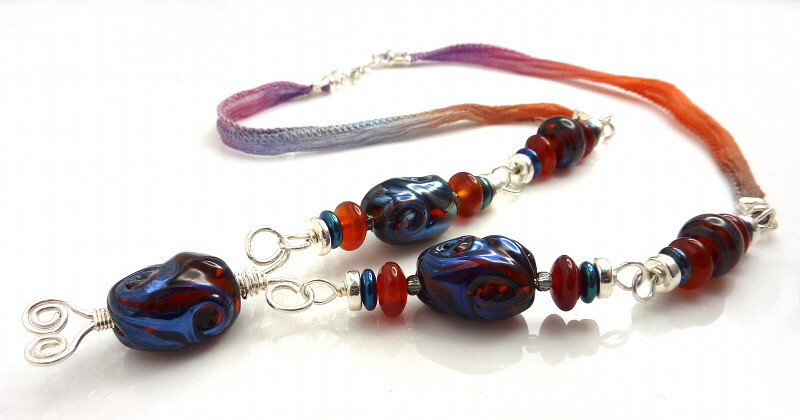 This BHB is raku over opaque orange, encased and with multicolour dark on the ends. Plus my triton murrini, that were reduced and then covered in dots of clear. This has made them go a paler blue-silver. I was surprised how the raku came out! It’s unusually uniform and looks rather like standard multicolour. I do like the colour though – it’s muted but very pretty. I also created an enormous fugly monstrosity of a lentil that has many things wrong with it, but these things happen! At this point, my silver glass stash included triton and aurae, plus some stringers (including the Ekho) and single rods I got from Knatty Dreadz when he was still selling them. It didn’t take me very long after the class to place a nice big order with Double Helix for their seconds! (These are rods that have failed visual quality control – ie they may be slightly knobbly or curved or oval. To be honest, I can’t tell the difference with most of them, and most glass manufacturers would happily sell them as firsts. Got me some aether too – their clear, which I am yet to try). When it comes to clear, Anouk recommends Reichenbach 1011 crystal, because it doesn’t affect the colour of the silver glass and can also be worked long and hot without ill effects. 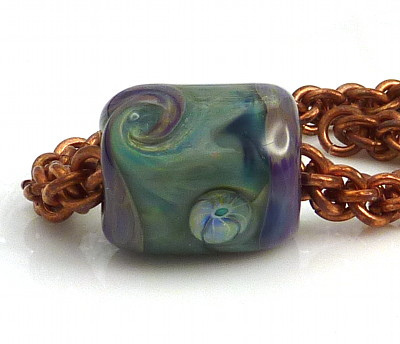 The beads above are using Effetre 006 because it’s what I had. My batch is decent, but I have noticed you can’t work it quite as hot. A final thing to sign off: this is mystic pink with stormed supernova dots and clear dots. Lauscha supernova isn’t the same as Double Helix reduction colours: you don’t get an easy surface sheen by reducing it – I spent a long time and it stayed purple! It’s a very nice purple, though. However, it can be stormed. 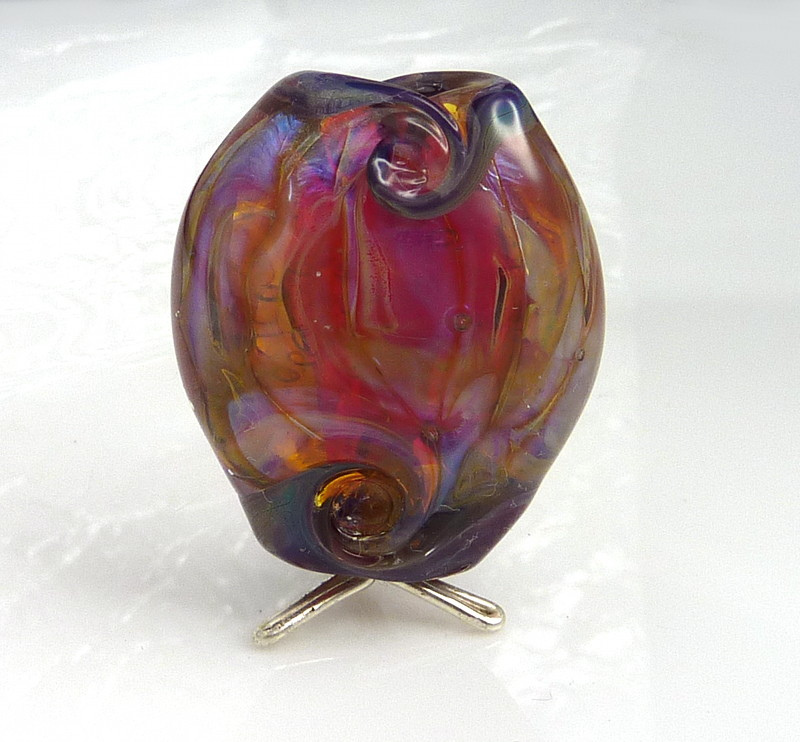 Storming is a technique by Amy Kinsch, see her tutorial Taking Reduction Glass By Storm. 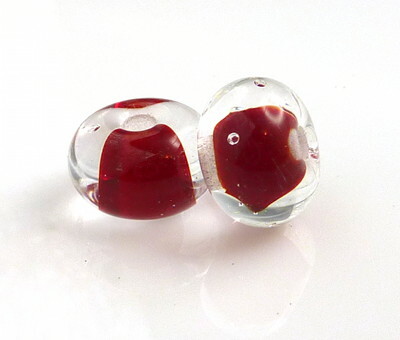 This pair of beads are CiM sangre encased in clear. Sangre’s a very handy transparent red – unlike Effetre striking red, it doesn’t go brown easily, and if you’re using a hothead, you probably won’t notice it’s a striking glass at all. The rod’s red, you wind it on and shape and it’s still red! On a minor you can go through the clear stage, though when I’ve used it so far it has still struck pretty automatically. I haven’t had to do anything to it on purpose. 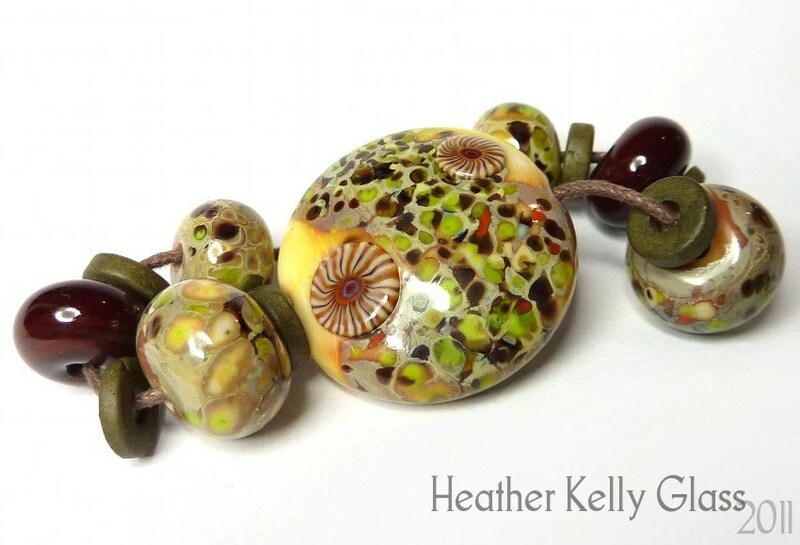 I’m posting these to remind myself how elegant simple beads can be. 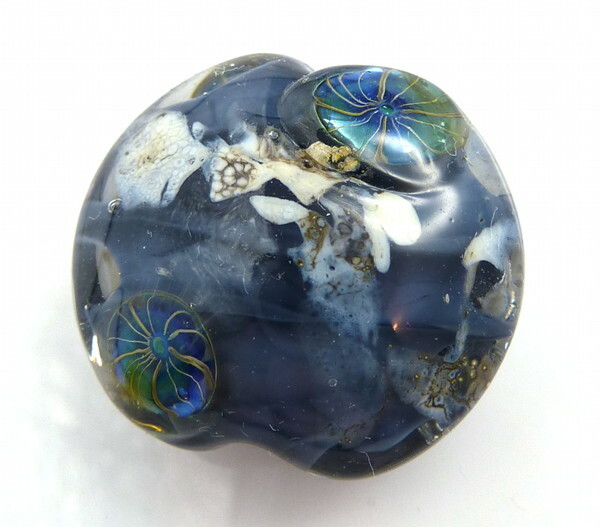 I’m rather envious of lampworkers who manage to make whole sets out of beads like these, with or without surface decoration. I’ve never managed the patience to do that yet myself! 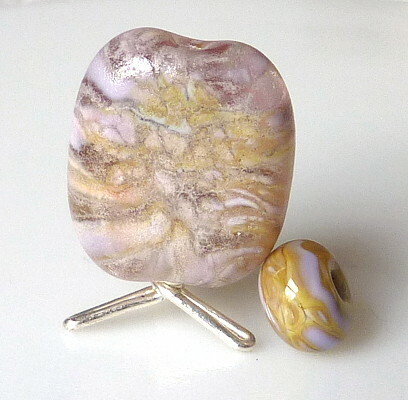 Focal and matching plain spacers, or pairs of decorated spacers I can do, but a set of 6-8 same size, same decoration beads? Nope. And I think that’s something I should work on. 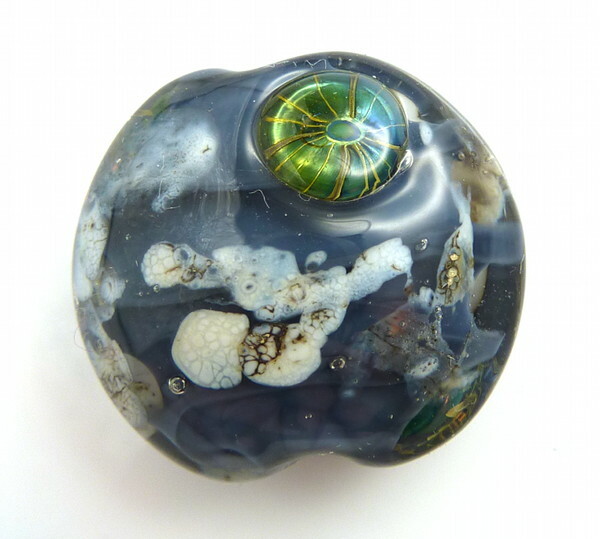 Part of the problem right now is that I work full time, so can only lampwork in the evenings and weekends, and I have something else that is also eating up a lot of that time right now. So when I sit down to torch I want to try as many different things as possible, rather than repeating one. 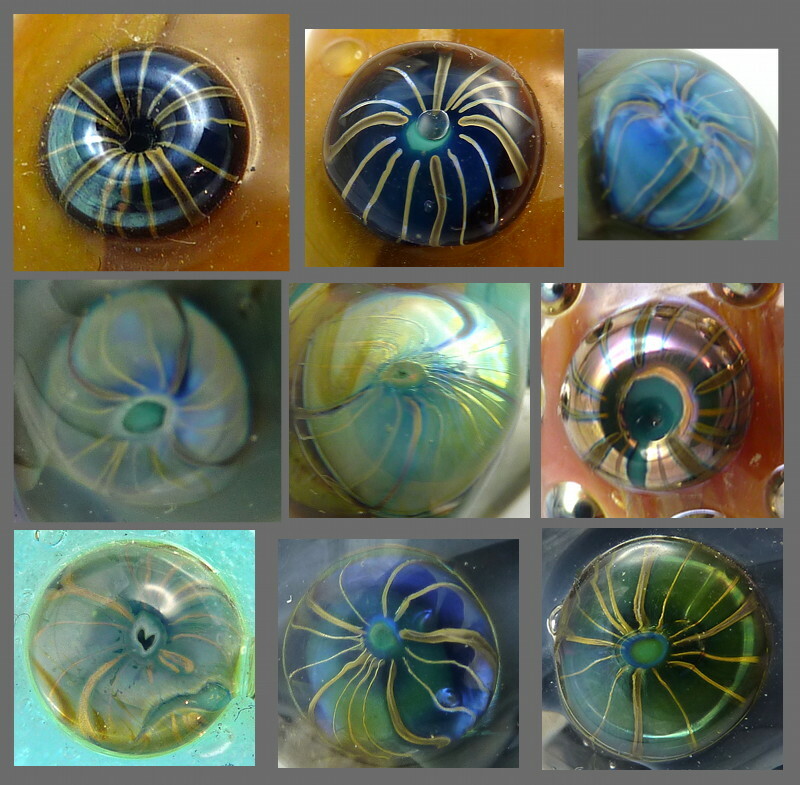 Hopefully later in the year I will have adjusted the work balance a bit so that I have more time for lampwork, and consistency and discipline in making sets is something I want to aim for then. To illustrate, now to jump to something completely different! This is red roof tile, partly encased in amber and with some triton murrini I made on the surface. 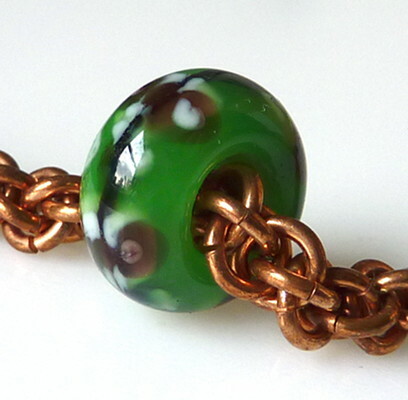 I like the colour contrast in this bead a lot, and I’m very pleased how the murrini came out. You can get quite a number of different effects out of them depending on how you treat them – the number of times reduced, whether you encase them, etc etc – which I intend to go into in a future post. Here’s what I made for the UKJC Secret Santa. (See there for the album of what everyone made). We send the present to our recipient anonymously, they post a photo when they receive it, and we have a big guessing game until we know who made what. 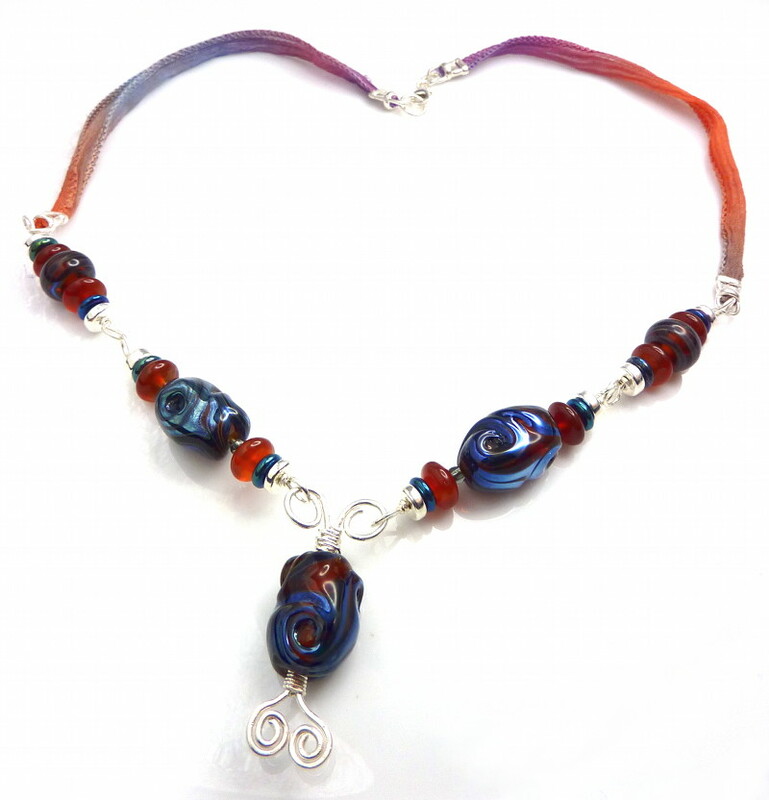 I made a necklace for Maggie using amber and triton swirled lampwork beads, peacock iridescent discs, carnelian discs, Greek ceramic spacers, sterling silver and another of Diane’s beautiful silk ribbons. I’d got the discs some time before and was pleased how well they matched! And here’s what I received! Made by Tabby. Isn’t it lovely? 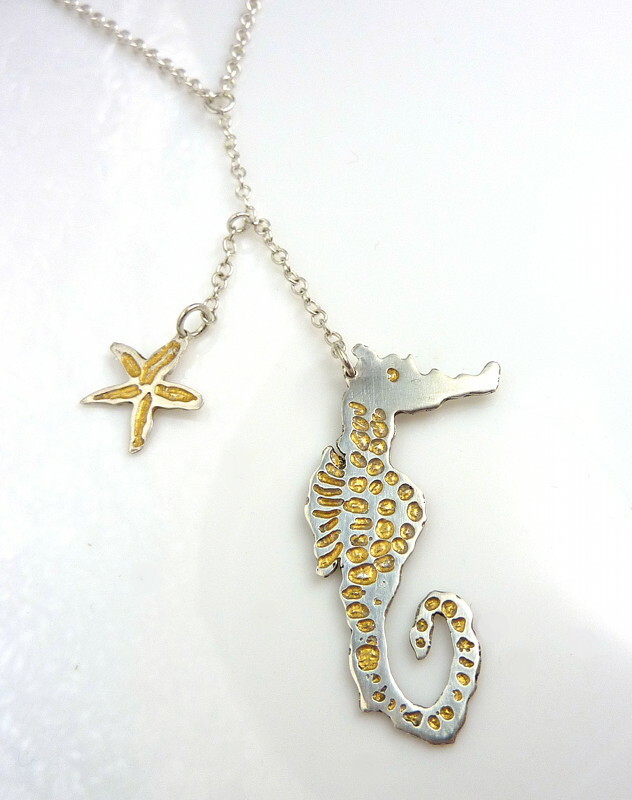 Silver necklace with seahorse and starfish. 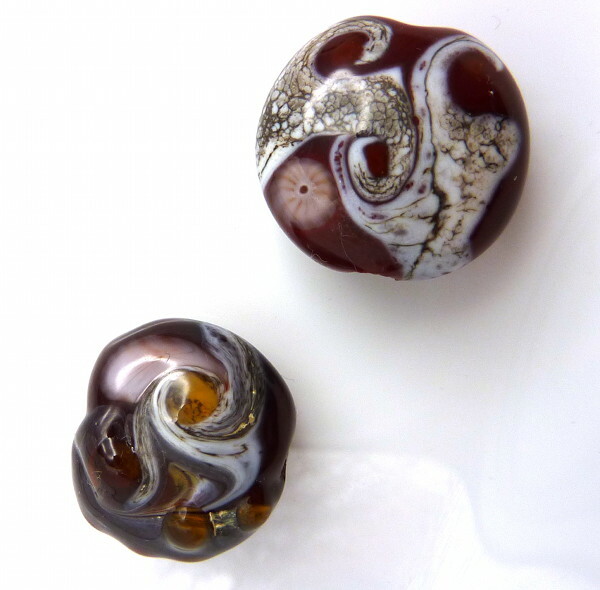 Theme of the month was Sparklers and colour of the month was Effetre chocolate brown 444 or dark chocolate brown 448. A go at sparklers. 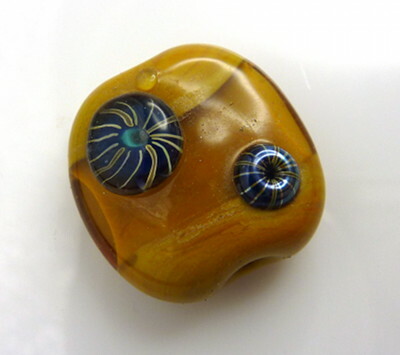 CiM poison apple base with dots in iris blue, pastel yellow and coral, plus black stringer lines. 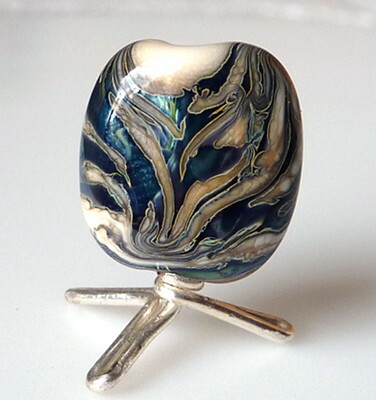 I love poison apple – it’s an opalino so you get a lovely depth to the colour, but is also opaque enough to keep its brightness. While I was at it, I made this BHB too. It has variously-stacked dots in transparent dark purple and white. They have slightly blurry edges on top of the poison apple. 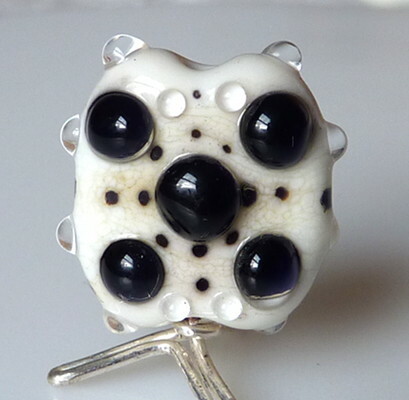 Ivory base, with triton dots that we will just pretend are black, ok? Way overheated them. Plus clear. If you ignore what it was supposed to be, I think it’s ok. The combination of ivory and clear is interesting and I should look into that more. Now, this is more like! Triton raked trails on ivory, pressed and reduced. The camera really flattered this one. 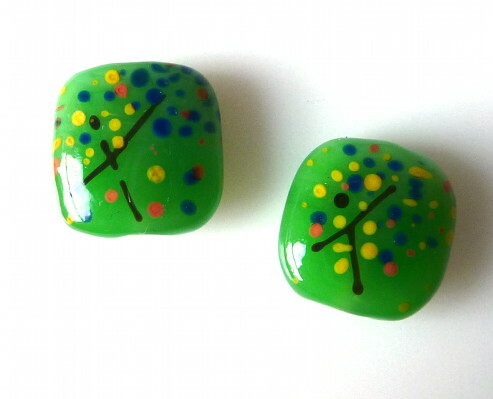 My colour of the month beads. (I think this was the dark brown). They have SIS shards, pink Cheeky Cherub broken biskwit murrini, and one also has some amber dots.